The entrance: a small place, lets give it a bold look. The entrance is a small place, there is no place in the house where we spend less time than in the entrance hall. So it is a perfect place to make a big statement. The entrance hall is often a place which is neglected when you start decorating the house. And there are a lot of reasons why you should pay as much attention to this room as you do to the other rooms. You can even go one step further: you love a colour but are afraid to use it to paint the walls, do it here. A bold wallpaper can be to much in the living room but can make a big impact in the entrance. The Italian Panoramic wallpaper of Iksel makes us feel as if we took nature with us inside, it creates visually also more space and the purple bench in front gives this classical interior a modern touch. The console and mirror finished with a patine give the room a French feeling. By adding some big green plants we make an even stronger impact, you will almost feel as in a winter garden. Make a bold statement: an impressive wall mural, printed on the dimensions you need, color splashes and some great design pieces make of your room an eclectic entrance. Look for a special mirror or console: it can be the color, the material or the shape. And just combine, don't think they won't match. Do it with confidence and you will create a wow effect. When we think of a house in the mountains than we think immediately of a rustic look, but it doesn't have to be, decorate it in a modern way. We go for the same materials which we would use in a more rustic interior but we bring them in a more modern shape. Nice wood, felt, leather, wool and heavy linen fabrics are perfect to make a cosy atmosphere. 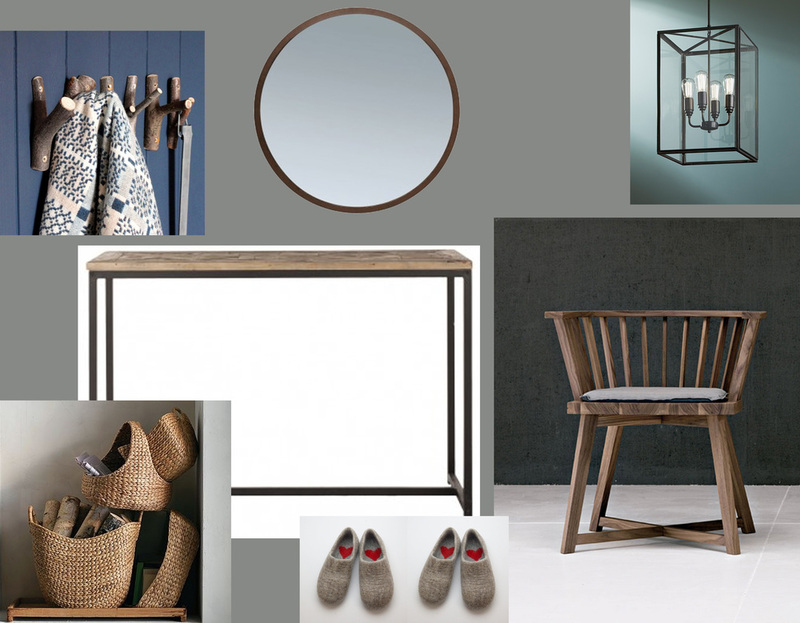 Wood in combination with metal for the console, a wooden armchair in a very clean line, and a touch of rustic for the hooks and the baskets. Natural materials, neutral colours and add some colour by painting one wall. Ideal for a small modern apartment in town: pure lines for the coatrack, wallpaper giving you the illusion of living in Venice and a console, special designed for the cat. Simple, playful, practical, you don't need more. When your house is filled with children than the entrance hall needs extra attention: it can be a joyful space, full with color splashes, combination of wallpaper and a frieze. Some storage where you can leave the bags, magazines and newspapers. A nice bench will make it easy for the kids to put on the shoes, colourful coatrack to hang all the coats and backpacks. Keep also some space to hang pictures, drawings and it will be a place with a very personal touch. And why not painting the entrance door in a bright color? We can also keep it simple: nice big mirror to take a last look before we rush out, simple stools in beautiful material and a minimalist hanging lamp. You can just paint the walls but what do you think of this wood veneer? Very refined, elegant and it gives something extra. Do we need more? Yes, we have to think of where to hang the coats and not to ruin the clean look. In this case it will be great to have a small walk in dressing. You can't make it to bold, just go for it, make it a space which make you feel great coming home in the evening. wish you a creative week!